Punjab Curry Club - Wellington Point uses their own specialised couriers to deliver their food. Pan fried seafood cooked with subtle spices, onions, tomato, capsicum and finished with cream. Your choice of fresh seafood cooked with garlic, ginger, onion, coriander, tomatoes, and authentic spices in traditional Indian kadahi style. Tandoori chicken tikka cooked with mild spices, tomato, cream and butter. Ground almonds, cashews and selected spices used to create this rich and creamy exotic curry. Tender chicken fillet prepared with mild spices, mango and cream. Tender chicken pieces prepared with onion, mushroom, hot spices and finished with cream. Delicious curry cooked with fresh garlic, sliced onion, tomato and fresh herbs and spices. Fresh chicken fillet cooked with capsicum, tomato and finished with cream. Marinated chicken pieces cooked with diced fruit, selected herbs, rare spices and cream.A favorite of the mughal kings. Fresh chicken cooked with yoghurt, lemon and exotic mix spices and herbs. Chicken cooked with fresh ginger, onion, coriander, tomato and authentic spices in traditional Indian kadahi style. 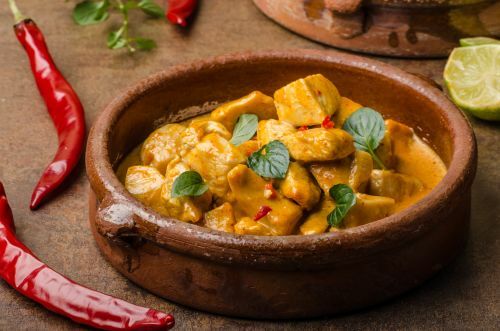 Chicken tikka cooked with coconut cream, hot authentic spices and simmered in onion gravy. Chicken tikka and mushroom cooked in authentic onion gravy finished with touch of cream and coriander. Traditional North Indian dish of chicken tikka cooked with creamed spinach and special blend of herbs and spices. Chicken pan fried with tomato, capsicum, and onions finished in a tangy sauce. Tender pieces of meat cooked with mild spices and cream. Ground almonds and cashews and selected spices used to create this rich and exotic curry. Marinated pieces cooked with diced fruit, selected herbs, rare spices and saffron. A famous north ndian dish of tender lamb/beef cooked with English spinach and a special blend of herbs and spices. Tender pieces of meat cooked with fresh ginger, onion, coriander, tomato and authentic spices in traditional Indian kadahi style. Tender pieces of meat and fresh vegetables cooked with ginger and garlic and served in a thick gravy. Mild curry cooked with authentic onion gravy coconut cream and mild spices. Choice of meat cooked with fresh chilli, hot spices, tomato and onion and finished with a touch of cream and fresh coriander. Fresh pan fried vegetables cooked with cream in a rich almond and cashew paste and finished with mild spices. Black lentils cooked with onion gravy, fresh cream, selected herbs and spices and tempered with butter. Tangy potatoes cooked with traditional spices and finished with fresh coriander. Our special curry seasoned with mushroom, potato and garden peas. Balls of cottage cheese or potatoes with cubes of cottage cheese cooked with capsicum, tomato and mix of spices. Ground almonds and cashews and selected spices used to create this rich and exotic curry with vegetable dumplings cubes of cottage cheese in it. Leavened bread cooked in the tandoor. Naan with a touch of garlic. Buttered and layered wholemeal bread. Naan made with dried fruits. Naan filled with cheese and a touch of garlic. Naan filled with cheese and spinach. Naan stuffed with lamb mince and spices. Naan stuffed with potaoes, peas and onion. Naan stuffed with chilli, cottage cheese, onion and coriander. Naan stuffed with potatoes, cheese, onions, hot spices and chilli. Naan filled with diced tandoori chicken and cheese. Rice cooked with cumin, peas and coriander. Rice pan fried with spices, mushroom, onion and garnished with fresh coriander. Rice simmered in coconut cream and garnished with coconut powder. Fragrant basmati rice cooked with spices, ginger, garlic, tomato and onions. Yoghurt based Indian drink with choice of sweet or salty.